Translocation site after implementation (April 2000). Photo credits: RECON Environmental Inc. SEVEN years after it was established, Otay Ranch's habitat restoration and enhancement program is paying ecological dividends on a grand scale. Among the major accomplishments are first-ever large-scale recreation of a maritime succulent scrub (MSS) habitat and largest-ever restoration of the endangered Otay tarplant. Otay Ranch is a 5,300-acre pedestrian-friendly planned community in southern San Diego County in the city of Chula Vista. As a result of a historic resource conservation plan, for every 1 acre of land developed in Otay Ranch, 1.18 acres is contributed to the Otay Ranch Nature Preserve. Over time, The Otay Ranch Company plans to contribute more than 2,500 acres to the regional open space preserve, which will be managed jointly by the city of Chula Vista and the county of San Diego. The preserve, which is growing through land contributions from other developers as well, will ultimately encompass 11,375 acres, or roughly 18 square miles. 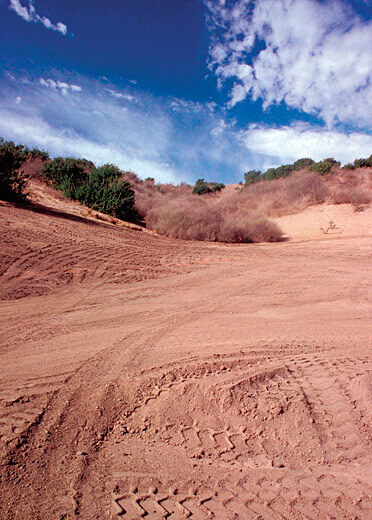 The $1 million restoration effort, financed by The Otay Ranch Company, was initiated to mitigate development impacts on approximately 27.6 acres. However, the program has gone far beyond the mitigation requirements. 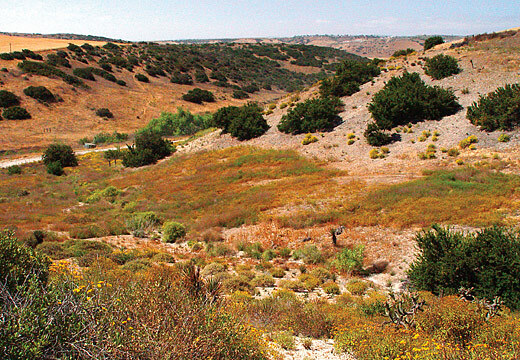 The Otay Ranch Company, working with RECON Environmental, Inc. of San Diego, has created 55 acres of maritime succulent scrub, a rare plant community that is habitat for a variety of bird species that are threatened or "of special concern," including the coastal California gnatcatcher and cactus wren. "Maritime succulent scrub is found only in the extreme southwestern California and northern Baja California regions," said Mark Dodero, senior biologist for RECON, who was the project manager for the entire restoration effort that included a team of approximately 10 restoration field workers. The rare MSS plant community, which has adapted to the area's dry conditions (approximately nine inches annual rainfall), is dominated by coast cholla, jojoba, live-forever and other succulents. In all, the MSS community was planted with more than 30 species of locally collected perennial and annual seeds and cuttings to mimic the density and distribution of nearby natural populations. "The project included the largest coast cholla cactus salvage and restoration that has ever been attempted," Dodero added. "We propagated many thousands of cuttings in an outdoor nursery on the restoration site that was nearly 2 acres in size. Cholla cuttings salvaged from development sites easily rooted when simply laid on the ground." "Recreating the large patches of coast cholla was the most challenging, but has the biggest potential payoff," said Kim Kilkenny, executive vice president of The Otay Ranch Company. "Cholla species are often called ‘jumping cholla' because of the ease with which stems detach when brushed, giving the impression that the stem jumped at you. The spines are barbed and can cause painful, slow-healing wounds. However, the dense patches of cholla we've created provide suitable nesting habitat for the endangered cactus wren and the coastal California gnatcatcher," said Kilkenny. "The cholla provides protection for these rare birds and they have already been sighted there, along with about 40 other species of birds." Salvaged topsoil ready for planting and seeding of Otay tarplant. The MSS restoration program began in the winter/spring of 2000; since then, the planted areas have been maintained and observed. There has been virtually no irrigation of the site**. Weed control efforts have continued for five years. Exotic species were controlled or removed using herbicide applications (Roundup®), with mechanical weed cutters and/or by hand. RECON maintenance workers are familiar with and trained to distinguish weeds from native species. ** During the first season, we did irrigate the MSS plantings with a water truck and hoses, as needed, to get them established. "For several years, we had so many weeds that we had as many as seven people in maintenance year-round working five days a week. Weeds surrounding some native species had to be pulled by hand, so maintenance was very labor intensive," said Dodero. Praise for the project has been widespread. Following a report on this project, Greg Cox, vice chairman of the San Diego County Board of Supervisors, whose district includes Otay Ranch, said, "Protecting the environment has been one of my top priorities as a county supervisor and I am happy to hear the good news about the accomplishments of this project. Our goal in working with Otay Ranch was to ensure a significant portion of land would be protected and, when possible, made available to the public to enjoy. This project shows that the goal is indeed being achieved." Jerry R. Rindone, Chula Vista deputy mayor, noted, "This project takes restoration seriously and can be used as a model for future habitat restoration. 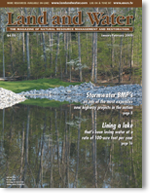 One of the most positive aspects of this restoration plan is that there is adequate funding in place that will lead to protecting this unique environment in perpetuity." "Restoration specialists who have observed the newly restored MSS community also have been very impressed," said Dodero. "It looks like a long-established, natural environment." RECON field crews planting salvaged grasses and bulbs. The Otay Ranch Company and RECON Environmental are equally proud of their work with the Otay tarplant, a federal endangered species that is listed as a state endangered species by the California Department of Fish and Game. It is an annual herb and a member of the sunflower family that is found almost exclusively in the extreme southwestern area of San Diego County. Otay tarplant is one of the few species that has adapted to the extreme conditions found in heavy clay soil, which expands when it is wet and contracts and cracks when it is dry. "The tarplant translocation program was the first ever attempted and extremely complex," said Dodero. "Development was planned for an area that supported approximately 500 individual plants. Our plan was to mitigate for this impact by creating a 3-acre Otay tarplant community with at least 2,000 plants (4:1 mitigation ratio). "We began by hand collecting seeds from the existing plants. (Seeds from native grassland species typically found in and around the natural populations of Otay tarplant were also collected.) Then the top three inches of surface soil (containing tarplant seeds) were removed with hand tools and stored in cardboard boxes. Next, heavy equipment was used to scrape the next six inches of soil; it too was stored. Finally, six inches of subsoil from the area was removed and transported to the restoration site in Wolf Canyon, a site that previously had been heavily grazed by cattle and contained a large number of non-native grasses," said Dodero. The restoration site had heavy clay soil and absolutely no natives. To prepare the site, about three inches of soil, filled with weed seeds, were removed using heavy equipment. The clay subsoil (moved from the original site) was then put into position. The created subsoil base was piled to a depth of four to six feet to mimic the typical clay lens habitat inhabited by Otay tarplant. Then, the subsoil was covered with the tarplant seed-bearing layer of top soil. Different soil translocation techniques were used in an effort to determine the method that would result in the most vigorous growth. 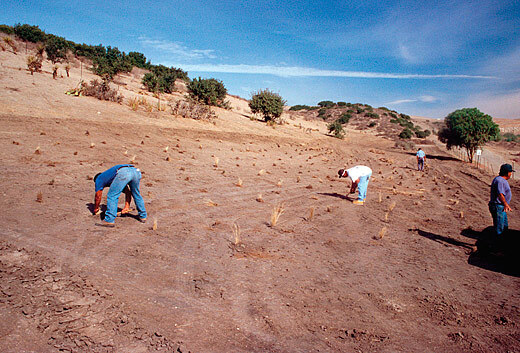 In some cases, Otay tarplant seeds, natural grasses and bulbs were planted by hand into weed-free subsoil. All of the methods produced vigorous growth, however the areas with weed-free subsoil were far easier to maintain in the long run. Restored MSS (foreground) and Otay tarplant population on lower slopes. 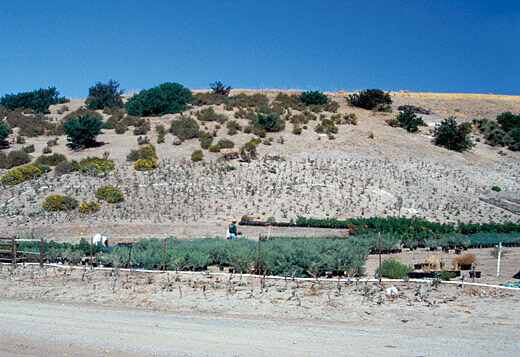 "Over the years, the plants have established a large Otay tarplant seed bank," said Dodero. "The number of individual Otay tarplant is known to fluctuate widely from year to year due to the variability of rainfall; populations tend to be lower in drier years and higher in years with plentiful rainfall. "In good rainfall years, the three-acre restoration site has had more than 300,000 plants – creating a virtual sea of yellow tarplant blossoms in late spring. And, its long-term survival is being aided by armies of bee flies, small native bees and bumblebees, all of whom are natural pollinators," said Dodero. "When we started, no one knew if large populations of Otay tarplants and maritime succulent scrub could be created," said Kilkenny. 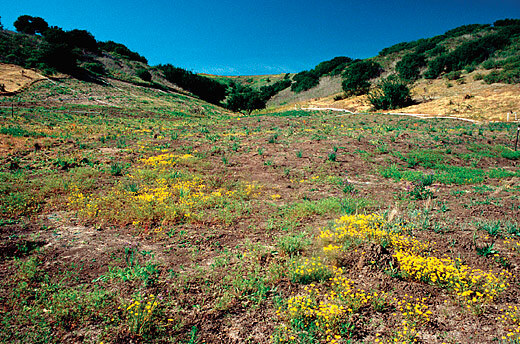 "We are delighted to report that these rare plant communities are thriving in the Otay Ranch Nature Preserve. It is an environmental success story; flourishing beyond our wildest hopes." For more information, contact Barbara Metz at metzpr@san.rr.com. ©2009 - 1998 Land and Water, Inc.